Tai Chi Chuan is a Half-open Door art. It has ceased to be an imperial, or aristocratic, or clan treasure hidden from outsiders, so it is no longer a Closed Door art. However, particularly for westerners, the door into Tai Chi Chuan is not wide open. Without the grounding in ideas, learnt “at your mother’s knee”, that a Chinese child soaks up, we can look at the players and still miss details. Yang Lu-Shan may have learnt his art from watching through a crack in the wall at the Chen practice, but he was reckoned to be something of a genius, as well as having the necessary background. The Tai Chi Chuan Classics clearly state the need for a teacher. The techniques we use, the particular movements, are what makes our practice Tai Chi Chuan, rather than another form of Qi Gong, or Self Cultivation. The written word is not a very good at describing much about movements and the details of movement, but that half of the door is fairly open through teachers, classes, videos and even photo books. I would like to try to give the other half, the not so open, to answer questions about method or stages; i.e. what is appropriate and when. To me, this means a syllabus, or description of a process of development. Simply listing all the different forms, two person exercises, weapons and applications will not give you a syllabus for Tai Chi Chuan. The art is too holistic, self referential, and embedded for such a linear list to be useful. Waving your arms and legs about, with or without weapons, with or without partners, will not necessarily lead to development. Our practice must be disciplined and principled. A frequent tag formula that we repeat regularly in my school is; “Find. Train. Use”. Often when translating, translators feel the need to insert the pronoun “it” to conform to the rules of English grammar. So we get; “Find it. Train it. Use it” which immediately begs the question; “What is it?” There is no single “it”. “It” depends on circumstances, level of accomplishment and objective. At first all your effort, attention and training focus is on the Rectification of the Body. You must Find what your body feels like. Where are the tensions, misalignments and distortions in your body? With this as your guide you must relentlessly Train your body to only express its Natural condition.We must Return to Nature. We must restore the body so that we are not blocked in structure, or wasting effort to maintain a poor posture. Then you can Use your Rectified body as the tool for the next level of exploration and study which is the study of Daoyin. Again you must Find the tracks, or spoor, of Qi as revealed in the Natural, spontaneous, preferred movements of the Rectified body. Once found they may be Trained so that they are reinforced and strengthened. This Training allows you to appreciate and perceive finer and finer details of movements and their accompanying sensations. These can be then Used to allow you to progress to the final and open-ended study of Nei Gong. Where once again the formula “Find. Train. Use” applies. The relationship between these three stages and specific Techniques of Tai Chi Chuan is not necessarily direct. For some students, certain practices might be more helpful at a given time, while their colleagues might need something a little different. For example, any posture can teach, demonstrate, or develop different aspects. The posture Brush Knee Push Step can be practiced for Rectification. You can stand still and sink into your image of the posture, or you can repeat the posture in an endless chain, concentrating on hanging from your head, feeling “sung” in all directions, with your elbows over your knees. It can also be practiced for Daoyin, feeling the way the movements of the torso and limbs are following guide paths, almost like tracks in the air. Then the Yin part and the Yang part can be explored, either in their own right, or as part of Daoyin, or as part of one of the other secrets – Spiral, or Centre turn, and the rest. 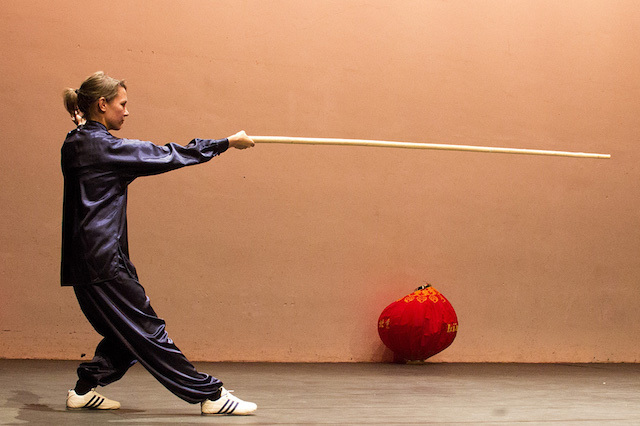 The teacher’s job, in any “quan”, is to teach both the moves and techniques, and the methods that make up that particular “quan”. As learning develops , a certain amount of change in students is both inevitable and expected. For, if your practice had no effect you would probably stop trying. However, in Tai Chi Chuan the physical moves are only half the story. They are the external, observable consequences of the qi flow. “Give food to the starving and you feed them today. The particular moves and postures of the different schools of Tai Chi Chuan are the vehicles chosen by the masters of those schools, which then become the evidence of students’ accomplishment. Differences between schools and styles are frequently differences in emphasis in teaching; what is important and when. For example, Chen style emphasises “chan ssu chin” or, in my terms, “spiral”, Yang style is noted for openness or “sung” with its long open postures, while Wu style lays stress on “open” and “closed”; qi and breathing techniques. All three styles overlap each other considerably and, at their zenith, all have “chan ssu chin”, “sung” and “opening/closing” of qi and breathing. What makes Tai Chi Chuan unique is not so much the techniques as such but also the methods of acquisition, development and execution of those techniques. So ultimately the role of the teacher in Tai Chi Chuan is considerably less than that of the student. The teacher is not so much there to teach you specific moves, techniques or forms. The teacher’s job is to teach you methods to enable you to “Find” whatever is relevant to your current level of development, be it Rectification, Daoyin or Nei Gong. Then the teacher should assist you with advice and suggestions as to how to “Train” whatever has been found. The teacher should guide and assist you to help you avoid mistakes and unproductive dead ends. Finally the teacher will show you how to “Use” whatever you have thus far “Found and Trained” either to advance to the next level or in direct application, functionally and pragmatically. There is a very real sense in which an art such as Tai Chi Chuan cannot be “taught” so much as “learnt” by the student. Ultimately it is your body that is the yardstick. The teacher is at best your guide, assistant and inspiration. Peter Gilligan is based in Ely, Cambridgeshire, UK and has written a book entitled ‘What is Tai Chi?’ which is published by Singing Dragon Press.